This article is about the year 1761. Ahmad Shah Durrani and his coalition defeat the Maratha Confederacy. 1761 (MDCCLXI) was a common year starting on Thursday of the Gregorian calendar and a common year starting on Monday of the Julian calendar, the 1761st year of the Common Era (CE) and Anno Domini (AD) designations, the 761st year of the 2nd millennium, the 61st year of the 18th century, and the 2nd year of the 1760s decade. As of the start of 1761, the Gregorian calendar was 11 days ahead of the Julian calendar, which remained in localized use until 1923. 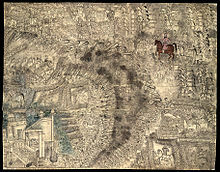 January 14 – Third Battle of Panipat: Ahmad Shah Durrani and his coalition decisively defeat the Maratha Confederacy, and restore the Mughal Empire to Shah Alam II. March 31 – An earthquake strikes Lisbon, Portugal. July 17 – The first section of the Bridgewater Canal is opened, for the transportation of coal from local mines to Manchester. October 5 – William Pitt is dismissed from his position as Secretary of State for the Southern Department (which administers Britain's American colonies) after having been a powerful part of a coalition government with the Prime Minister, the Duke of Newcastle. King George III, who had ascended the throne a year earlier, despises both men and takes the action two weeks after his formal coronation. November 7 – The New London Harbor Light is first lit to guide ships into the Connecticut harbor; the lighthouse, only the fourth to be built has been in continuous operation for more than 250 years. November 26 – A 500-man force from the Army of Spain brings the revolt of Mexico's Maya population to an end, capturing the Yucatan village of Cisteil, killing about 500 of the 2,500 Mayan defenders and losing 40 of their own. The Spaniards arrest 254 people, including Jacinto Canek, who had proclaimed himself as King Canek Montezuma of the Mayas. Canek and eight other rebellion leaders are executed less than three weeks later. Faber-Castell Company is founded by Kasper Faber in Nuremberg, Germany. Johann Heinrich Lambert finds a proof that π is irrational. ^ "Historical Events for Year 1761 | OnThisDay.com". Historyorb.com. Retrieved June 30, 2016. ^ "Landmarks of World History: A Chronology of Remarkable Natural Phenomena: Eighteenth Century 1761-1770". The Gallery of Natural Phenomena. 2010. Retrieved February 1, 2016. This page is based on the Wikipedia article 1761; it is used under the Creative Commons Attribution-ShareAlike 3.0 Unported License (CC-BY-SA). You may redistribute it, verbatim or modified, providing that you comply with the terms of the CC-BY-SA.